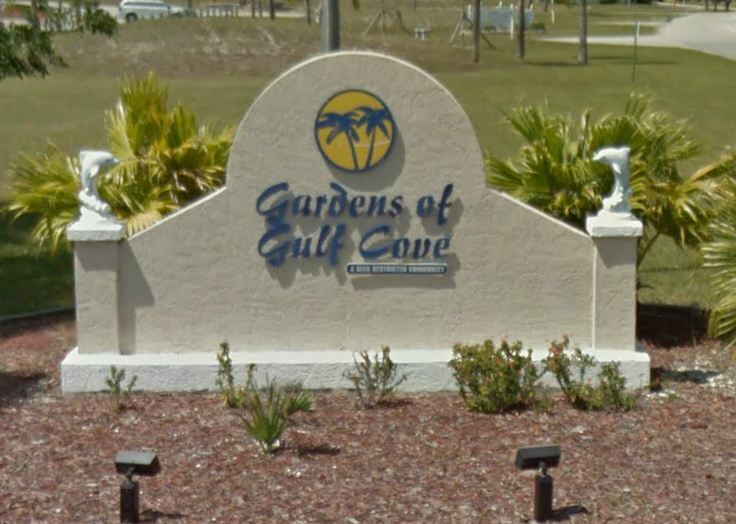 Gardens of Gulf Cove is a small community located just minutes to the beautiful Englewood area and Gulf beaches. It has easy access to Boca Grande and Gasparilla and is just 10 minutes to the Port Charlotte Town Center Mall. It is also convenient to shopping, dining, fishing, boating, and golfing. It is west of Gulf Cove and north of South Gulf Cove in Port Charlotte, FL off of 776. Most of the homes are very affordable and have two to three bedrooms which make a great starter home, retirement home or family home. There are a variety of sizes from 900 square feet to 2,000 square feet. The original homes were built in the 1970’s to 1980’s, but there are some newer homes as well. There is a small homeowner association fee and deed restrictions. This established community has sidewalks, street lights, and underground utilities. Some of the homes in the community are located on a canal with Gulf access by small boat. There is also a boat ramp located nearby. There is a Publix grocery store within walking distance of the club house as well as banks, restaurants and Home Depot. Bike paths are located throughout the community for easy traveling or riding. There is a secure RV storage lot for those residents who own a recreational vehicle or trailer. The community itself offers many amenities including a large recreation center and club house. The Recreation Center has an outdoor heated pool, billiards, Ping-Pong, various games and puzzles, and exercise equipment. The Club House has an outdoor pool and offers workshops, board meetings, pizza parties, dinners and dances. You can even rent the Club House for family events such as weddings, receptions, and anniversary or birthday parties. At Gardens of Gulf Cove you can become involved in a variety of social activities. There is something for everyone such as aerobics, aquacize, arts and crafts, basketball, bocce ball, pool tables, bowling, bridge, exercise classes, chorus, garden club, horseshoes, poker, quilting, shuffleboard, tennis and more. For more information on this community and to see photos, their bylaws, covenants and restrictions go to their web site at http://thegardensofgulfcove.com/Home_Page.php. The community is managed by Gardens of Gulf Cove Property Owners Association, Inc., 6464 Coniston Street, Port Charlotte, FL 33981. Office phone: 941-697-4443, fax: 941-698-9274. Tags: Gardens of Gulf Cove | Permalink.